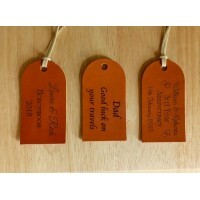 Leather luggage tags for 3rd Anniversary Gift or other occasion. 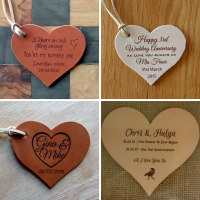 Engraved and personalised to any de..
Leather Hearts engraved for any occasion but particularly popular for 3rd Anniversary Gifts. You can..
Leather Tag or Keyfob, personalised with the Las Vegas Welcome sign. Were you married in Vegas and w.. These large leather tags can be used as personalised luggage tags or large leather keyrings. Especia.. 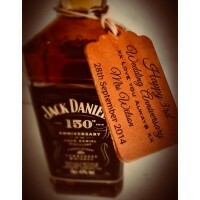 Perfect gift for a Leather Anniversary. 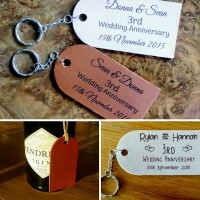 A personalised keyfob or leather tag, novelty luggage tag. 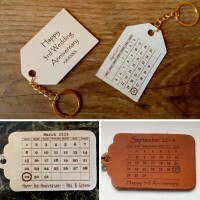 T..
Leather Tags engraved with the month you were married and the date of your wedding circled. Availabl.. These little leather tags can be used as keyrings or just tags to hang on bags or other items. Maybe..